The strange geology of the Burren – Slieve Roe from Mullaghmor in the Burren NP. The Burren, on Ireland’s west coast in the county of Clare, is an area of limestone rising to a modest 300 metres above the nearby sea level. The limestones, from the Carboniferous period, were formed 340 million years ago in a warm shallow sea, and subsequent erosion and the scouring action of glaciers that receded 10,0000 years ago, have exposed these limestones at the surface. 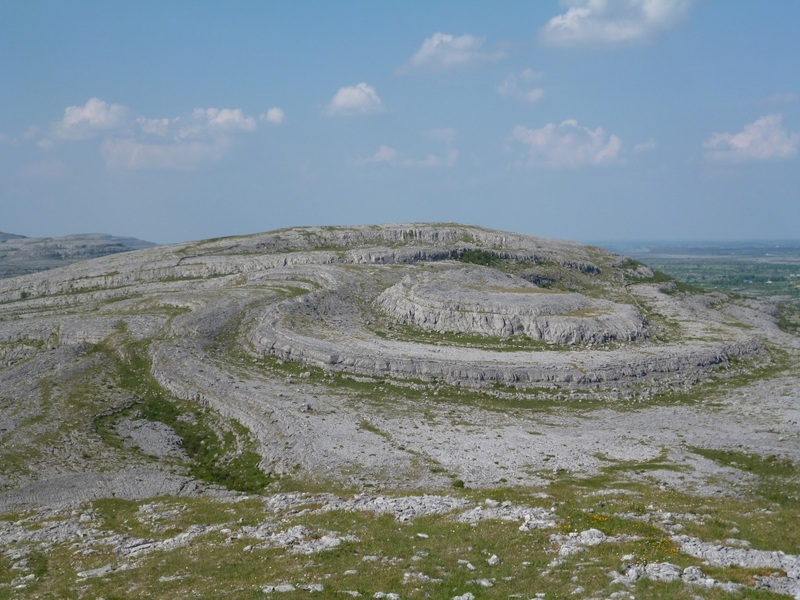 This is a karst landscape, weather worn into limestone pavement of clints, grikes and runnels, with sink holes and underground cave systems. Fossils of tabulate corals are fairly common, particularly on Mullaghmor. Sea urchin, ammonite and crinoid, (sea-lily), fossils can also be found. 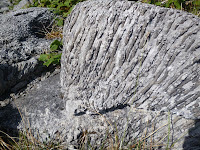 Despite this astonishing geological landscape, the Burren is probably best know for it’s unique mix of arctic-alpine and Mediterranean flora. As the glaciers retreated, the newly exposed land surface was colonised by plants that today are found on the arctic tundra and on mountains above 1500 metres. With the warming climate, these arctic-alpine plants hung on in the Burren, and were joined eventually by plants of much more temperate areas. Indeed, the warming nature of the Gulf Stream and the heat retention properties of the limestone enabled plants that would normally be found much further south to thrive here, giving a unique and remarkable assemblage of flora, and in such abundance that can leave a lasting impression on those who visit the area. Burren in Bloom is a festival that celebrates this abundance, and takes place throughout the month of May, the best time of year to see the wild flowers. 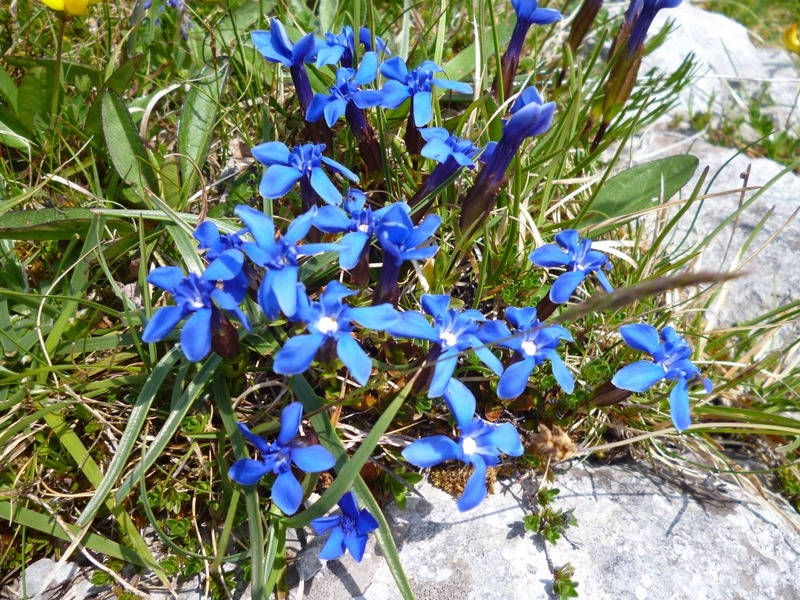 However, we visited in early June, and due to the late spring this year, still saw a glorious display of diverse colour on the limestone slopes. 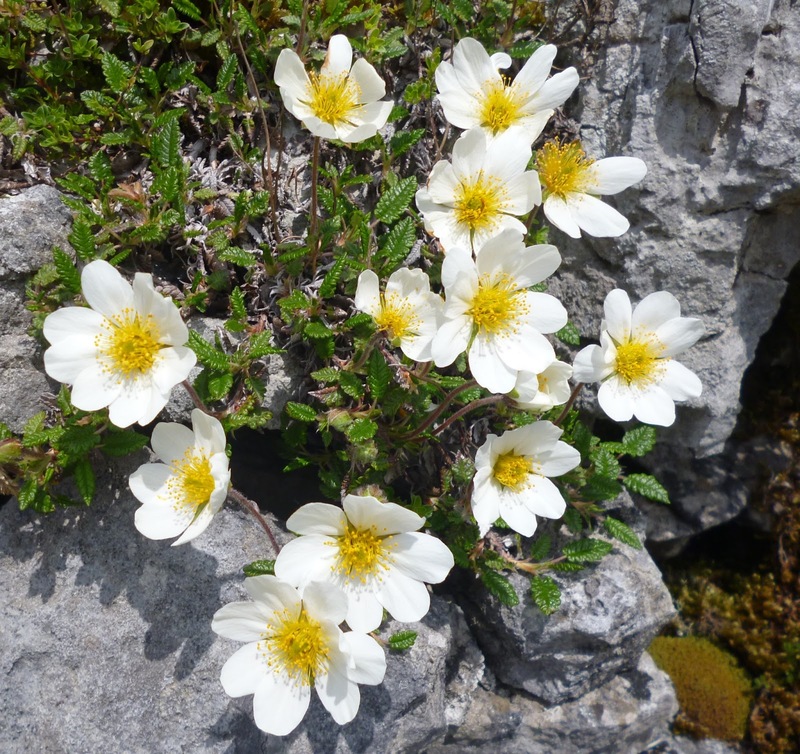 Most abundant was the Mountain Avens, a plant associated with climates much further north, it’s ground hugging foliage covered in a mass of yellow and white blooms. 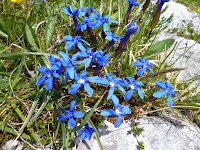 We walked the green roads, un-metalled tracks, over the low hills in search of the Spring Gentian, and were rewarded by finding this solitary piercing blue flower in abundant clumps. It is said that if you pick this flower and take it into your home then you will be struck by lightning, but we contented ourselves by taking photographs. 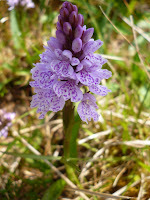 Orchids are another of the Burren’s iconic plants, and there are several species that can be found here. One of the most commonly found orchids is the Heath Spotted Orchid, but it is often hard to identify correctly as the species has a very variable nature, and there is a strong degree of cross breeding between the species. Despite this, we confidently identified the Heath Spotted as well as the Early Purple Orchid. We identified many more plants, but one of the more unusual to find here would be the Mossy Saxifrage, a plant of the Arctic tundra regions and mountain ranges between 1900 and 3000 metres. Yet here found at a modest few hundred metres above sea level. Over 70% of Ireland’s native flora can be found in the Burren, not all flower in the spring, but it is certainly the best time to come and enjoy this spectacle of colour and abundance. I never really tire of it, and will certainly be back again next spring, and I hope the weather is as good as it was this year!